“This is a provision for affirmative action. For thousands of years, these classes were subjugated. They could not walk on the streets with the upper castes.The State has to protect them. As per me, they should be given the same number of posts in promotion as they are entitled to in matters of appointment, depending on population of the states”, submitted the Attorney General of India. A Supreme Court five judge bench on Friday commenced hearing on the question of reconsideration of the court’s 2006 judgment in M. Nagaraj, in view of a challenge to the interpretation of Articles 16(4), 16(4A) and 16(4B) of the Constitution. In the 2006 judgment, the Apex Court had held that it is not mandatory for the State to make reservations for SC/ST in matter of promotions. However, if the State did wish to exercise its discretion, it is supposed to gather quantifiable data showing backwardness of the class and inadequacy of representation of that class in public employment, in addition to compliance with Article 335. The correctness of interpretation given by Nagaraj decision that State should gather quantifiable data showing backwardness of the class and their inadequacy in representation to provide reservation for them in promotion was doubted, and was referred to Constitution Bench for reconsideration during November 2017. 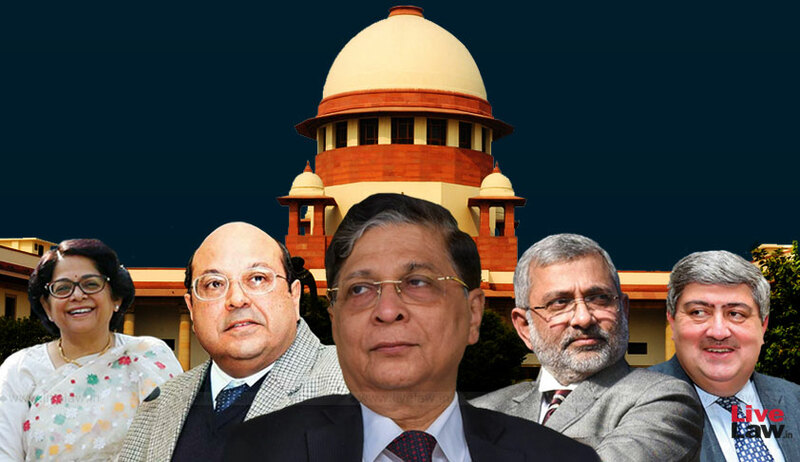 According, a Constitution Bench consisting of Chief Justice Dipak Misra, Justice Kurian Joseph, Justice R F Nariman, Justice S K Kaul and Justice Indu Malhotra was constituted to decide this issue. Opening the debate, Attorney General K. K. Venugopal objected to the requirement of proving backwardness especially for the SC and ST. It was his submission that the criterion of backwardness of SC and ST categories was already satisfied by notification under Articles 341 and 342. He indicated how the constitution bench in E. V. Chinnaiah (2004) had set aside the apportionment made by the state of Andhra Pradesh of the 15% reservation for the SC in the educational institutions and in the services of the state amongst 4 groups depending on the extent of backwardness. “The court in M. Nagaraj says that Article 16(4A) is an enabling provision not a compelling provision. Why do you say the judgment is incorrect?”, inquired Chief Justice Dipak Misra. “Indira Sawhney (1992) said that the reservations in matters of promotion already provided shall continue to operate for a period of 5 years and that was taken away by the introduction of Article 16(4A). M. Nagaraj says that Articles 341 and 342 apply in respect of the initial entry while further progress is subject to imperatives”, continued the Chief Justice. Referring to the phrase “in the opinion of the State, are not adequately represented in the services under the State” in Article 16(4A), Justice Rohinton Nariman opined that the same speaks of quantifiable data. “Once the President has so decided under Articles 341 and 342, the class will be assumed to be backward.The benefit of Article 16(4A) is on the SC and ST and now they cannot be classified into backward or not backward.’backwardness’ has been added by court as an additional condition.”, responded the AG. He cited the 1976 seven-judge bench decision in State of Kerala v. N. M. Thomas where the classification of employees belonging to Scheduled Castes and Scheduled Tribes for allowing them an extended period of two years for passing the special tests for promotion is reasonable. The AG submitted that the said ruling had not been referred in M. Nagaraj. “What you are saying is that the need to compile quantifiable data should connect only to inadequacy of representation and not backwardness? You are saying that showing backwardness of a class is wholly unnecessary?”, clarified Justice Nariman. “The test or requirement of social and educational backwardness cannot be applied to Scheduled Castes and Scheduled Tribes, who indubitably fall within the expression ‘backward class of citizens’”, quoted the AG from the nine-judge bench verdict in Indira Sawhney. He stated that affirmative action will be illusory if promotions are denied to SC & ST categories. “This is a provision for affirmative action. For thousands of years, these classes were subjugated. They could not walk on the streets with the upper castes.The State has to protect them. As per me, they should be given the same number of posts in promotion as they are entitled to in matters of appointment, depending on population of the states”, continued the AG, pressing for a 22.5% reservation, 15% for the SC and 7.5% for the ST. In respect of the parameter of inadequacy in Representation, the AG advanced that how the same has to be determined is a matter for consideration- whether it has to be for individual posts or a class of posts or a cadre as a whole, whether the overall position in the state has to be looked into, whether the percentage of population of the class as to the whole population of the state or, in case of services under the Union of India, of the country has to be considered. He made reference to the roster system for reservation in appointments under Article 16(4) as discussed in R. K. Sabharwal v. state of Punjab (1995). In determining the backward class/classes which is not adequately represented in the State Services, the state government may take the total population of a particular backward class and its representation in the State Services. When the government after the necessary exercise provides the extent of percentage of posts to be reserved for the said backward class then the percentage has to be followed strictly, the AG elaborated. Noting that the roster system is intended for the entry point, the bench inquired if it is applied in matters of promotion. The AG asserted that the system is the only way of collecting quantifiable data as to inadequacy after which nothing more is needed and that the employment of the roster system to promotions would keep reservation within the 50% ceiling limit. “Adequacy is a constitutional rider.Both Nagaraj and Sabharwal say that cadre is the unit and when you express an opinion as to adequacy, it means quantifiable data qua cadre”, observed the Chief Justice on Friday. “If the reference to backwardness goes away, empirical data pertaining to the inadequacy in representation is still necessary for reservation in promotions in a cadre, to determine what is the representation of the particular class in that cadre. What is impact of the judgment (in M. Nagaraj) if backwardness is taken away?”, asked Chief Justice Misra. “Filling up of vacancies is a continuous process...(to determine the inadequacy in Representation) every time a vacancy arises will be a practically impossible situation...with people dying or retiring, it is a dynamic, fluctuating aspect”, replied the AG. “How is that to be done? There have to be some principles”, repeated the AG. Suggesting that the matter be referred to a larger bench, the AG concluded his submissions for the day. In his turn, Senior Counsel Rajeev Dhavan asserted that ‘backwardness’ is the prerequisite for the entire clause (4A). Referring to the ‘creamy layer’ concept, Dr. Dhavan advanced, “The question before Your Lordships is if the SC/ST can be split? ‘Creamy layer’ means that a person who belongs to a backward class is no longer a member of that group...’creamy layer’ indicates the social backwardness of the group but not of the individual”. Justice Nariman weighed in that inadequate representation for the purpose of Article 16(4A) is only qua SC/ST and that “by applying ‘backwardness’, you cannot be allowed to go back, but you have to look at inadequate representation in that subdivision only”. The hearing will continue next week.